A holiday can be defined by a list of things to do. For others, it’s about exquisite beauty. If you’re part of the latter, Ana Capri Estate is the place to be. The ideal overlook is of Guana and Great Camanoe; there are few views in the world that can compare to this one. One step outside to any of the multiple decks this property offers will reveal a Caribbean wonderland you simply won’t want to miss. Inside you’ll find luxury combined with old world styling. An infinity pool and a two-tiered sun deck provide the perfect way to look out over the natural beauty that will define your vacation. Mesmerizing views of the surrounding islets and cays! 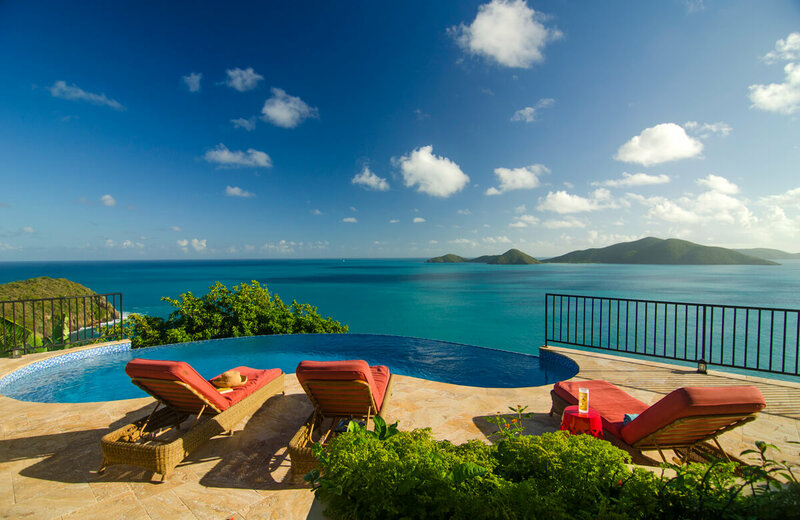 Ana Capri Estate sits on an acre and overlooks Tortola’s natural panoramic view of Guana Island, Great Camanoe, and over to The Dogs and Virgin Gorda. Recently completed, it includes four bedrooms as well as a number of decks and balconies. This two-story property includes a large Great Room on the main floor. Inside the Great Room is a corner dining area and a gourmet-level kitchen with new appliances and granite counter tops. The Great Room also includes a Sonos music system equipped with internet radio, a library of DVDs, a 55-inch HDTV with satellite service and surround-sound speakers, a Sony PlayStation 3 with games, books, board games, and puzzles. The verandah faces the ocean and includes chairs and a sofa so you can look out over Rogues Point to your left and Josiah’s white sand beach to your right. It connects to the Great Room with sliding glass doors so you have an unobstructed view inside as well. The kitchen and dining area open to the pool deck which includes a table, chairs, and a gas grill, all of which are situated under the roofed pavilion. The outdoor eating area overlooks both the infinity pool and the ocean. The pool deck comes complete with chaise lounges. Just off the Great Room, you’ll find a powder room, a laundry room, and two queen bedrooms with en-suite baths and balconies. A staircase leads upstairs to AnaCapri’s second floor, to the large master king bedroom suite. And next door, the bedroom/study offers a comfortable pull-down queen Murphy bed (perfect for small children who need to be close to their parents). The Queen Murphy Bedroom is private from the master suite but does not have a private bathroom. It shares the bathroom with the upstairs master OR uses the Powder room off the living/dining area. All baths feature tiled bathrooms with showers (the large main-floor end suite also has a bathtub). The sliding glass doors in the air-conditioned romantic master suite open out to a private outdoor lounge, roofed and furnished with cushioned seating which overlooks the pool and decks. A few stairs lead from the master suite’s verandah down to the pool levels. The infinity pool is flanked by a two-tiered tiled sun deck with chaise lounges, and an alfresco dining table sits poolside under a roofed pavilion. Just in front of the estate is an herb garden that produces two kinds of basil, garlic, green onions, thyme, oregano, lemon grass, and spinach. Bananas, plantains, and papayas also grow on the property. From here, you will find a walkway that leads to another outdoor dining area, as well as steps that lead to the “Place in the Rocks” patio that is surrounded by huge boulders and overlooks the sea. AnaCapri’s air-conditioned queen guest suite is situated on this level. This spacious villa is situated on a green hillside and constructed with columns and eyebrow windows to create additional spaciousness and light. The estate includes hand-blown Murano glass fixtures brought from Italy, as well as personal photos taken in Italy by the owner. Hand-carved mahogany furniture also graces the property. All five beds at AnaCapri Estate are also of mahogany, with Euro-style pillow-top mattresses for a plush, wonderful night’s sleep. Road Town’s shopping and dining is just a 10 to 15-minute drive away as are a number of beaches. 55-inch flat screen HDTV with satellite + PS3 DVD player with surround-sound speakers in the Great Room, DVD movies, Sonos music and internet radio to choose from + iPod dock; Sony Play Station 3 with Play Station Move controllers and games; books, games; BVI cell phone with voice mail for guests’ use (loaded with a $30 starter credit), Wi-Fi throughout the entire villa + outside on patios + decks. A/C in all three bedrooms + in home office/study bedroom. Safes for valuables in all bedrooms. All bathrooms have complimentary toiletries + a hair dryer. Gourmet kitchen with Zojirushi Coffeemaker, coffee bean grinder, Crock Pot, blenders, dishwasher, garbage disposal + a big array of cooking + baking dishes; kitchen/herb garden; and fruit-bearing trees. Binoculars, hammock, gas grill, TravelEase Elite Play Yard crib/playpen for baby, beach chairs, 4 sets of assorted snorkel gear, 4 boogie boards + a cooler with wheels; electronic gate into property, automatic generator, and washer + dryer. A complimentary welcome dinner will greet all arriving AnaCapri Estate guests (chicken, salad, bread, bottled water, chocolate, and a bottle of wine). * 2 queen-sized airbeds are available with guests’ advance notice at $50 per person, per night, plus 7 percent BVI Hotel Tax. Queen Murphy Bedroom shares bathroom with upstairs master OR use Powder room off living/dining area. All baths feature tiled bathrooms with showers (the large main-floor end suite also has a bathtub). Welcome with a notarized Liability Waiver for all children under 12 years, please.